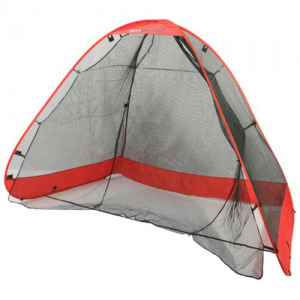 The ProReturn X2 Golf Practice Net combines all the attributes of the best practice nets. The unique shape of the inside net catches your ball before rolling it back to you. Super fast set-up with unbreakable spring steel frame that "pops" open, and folds down in seconds. Instructions are sewn directly into the bag, and includes stakes and stabilizing cords for windy conditions. Can be used for soccer, golf, baseball and cricket. Not sold in retail packaging. If you have any questions regarding the ProReturn X2 Golf Practice Net, please give us a call, we would be happy to help you with any questions you may have. Write an online review on the ProReturn X2 Golf Practice Net, and share your thoughts with others.